Mid Michigan Community College (MMCC) recently hosted 50 fifth-grade students from Renaissance Public Academy in Mt. Pleasant at an event aimed at exploring careers in technology. Students visited MMCC’s Morey Technical Education Center in Mt. Pleasant where they toured the facility and engaged in hands-on activities focused on Computer Aided Drafting and Design (CADD) and 3D printing. Students spent an hour and a half at the Tech Center developing a greater awareness of manufacturing and the various technological fields associated with modern production. During that time, the fifth graders designed 3D models of cell phone cases using SolidWorks CADD software. Overseeing the event were Eric Sander, lead CADD faculty at MMCC, and three current students in the college’s CADD program. Stephanie Papenfus from Renaissance Public School Academy coordinated the event as part of the school’s effort to introduce students to a variety of career possibilities. The fifth graders had positive responses to their time at the Morey Technical Education Center as well. Located on MMCC’s Mt. Pleasant campus at the corner of Broadway and Summerton, the Morey Technical Education Center offers flexible learning spaces to accommodate a variety of training programs that meet present and future demand for skilled manufacturing personnel. While the facility houses dedicated welding and CADD labs, other areas are open and meant to respond to specific training requests from area manufacturers. 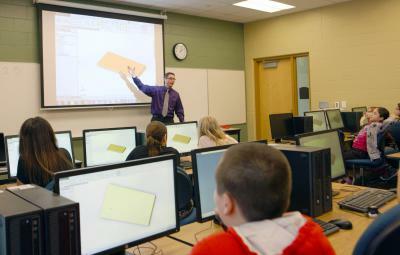 For more information about MMCC’s technical centers, visit www.midmich.edu.